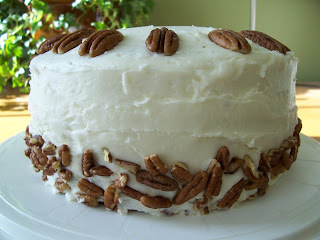 After a year of blogging, I have come to know some really great bakers. One of the very first blogs I read was Cream Puffs in Venice, written by the inimitable Ivonne. When I saw that she was part of a monthly baking challenge I quickly emailed her and asked to join. It looked like fun and I hoped would compel me to make new and interesting treats. 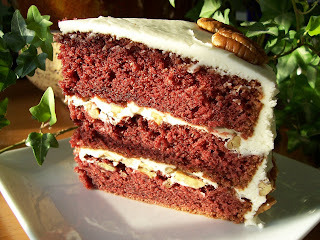 For the March challenge, the group, now named Daring Bakers, decided to tackle Red Velvet Cake. I have never made a Red Velvet cake but have heard about them here and there. It is a pretty simple cake to make requiring a standard creaming method. There was some debate on which recipe to use as some members did not want to use oil. It was decided we would all use our own recipe. I used a recipe initially posted by Peabody which contains oil. I don’t mind using oil and like to make a recipe to the letter when first trying it out before making changes. When I made my cake, the batter was almost fuchsia. I only have two pans so I measured the batter out evenly; baked two and then the remaining batter when they were finished. Baked, the cakes were darker brown, like a chocolate cake, and I wondered if I put enough food colouring in the batter. Next I made the icing by melting butter and cream cheese. To me, this made no discernable difference than had I creamed them. After assembling the cake it was time to try it out. I was nervous about this because I had no idea what to expect. After cutting it, the red layers were very noticeable and most people liked it. The cake was moist and the icing was yummy. The cake didn’t have a specific flavour – it just tasted like cake that happened to be red. After putting it in the fridge overnight I found the flavour improved the next day. The best part of this challenge is not so much the cake, but the great women I’ve met this past month. I would also like to thank Ximena from Lobstersquad for making our fantastic logo. If you’d like to check out the other Daring Bakers’ Red Velvet adventures, just follow the links below. "These crunchy, not-too-sweet, double baked cookies, also known as mandelbrot and kamish, are a Jewish version of Italian biscotti." Kamishbrot is prepared the same way as biscotti and this particular version is sprinkled liberally with cinnamon sugar. The dough is made with vegetable oil, not butter, and they taste delicious. I know some people have oil aversion when it comes to baking but in these cookies it works fantastically. Sometimes I find that biscotti recipes call for overly long baking times resulting in burnt or ultra hard cookies. This recipe (for me, at least) was dead on. The cookies came out golden and crisp - perfect for dunking in a latte or hot tea. The chocolate chips, nuts and coconut taste great together with no dominating flavour asserting itself. If you've never made a double-baked cookie, this is a good place to start. The recipe is straightforward though, you will have to do some shaping and rolling. Just give yourself enough time to chill the dough and bake the cookies. A little patience goes a long way. Last weekend my family and a bunch of good friends trekked out to Mountsberg for their annual Maple Syrup Days. I went last year and it is always a good time - pancakes, maple candy and wagon rides. I left with a bottle of local maple syrup already having something in mind for it. 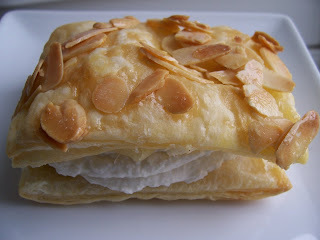 Almond Ricotta Napoleons are a quick impressive little dessert. Using frozen puff pastry you make the shells which are simply brushed with maple syrup and almonds. While they're baking, you prepare a ricotta/whipped cream filling. There is very little sugar in the filling and I wanted it sweeter so I added some maple syrup. Yum! The ricotta folded in nicely with the whipped cream though the final result was not 100% smooth. This didn't detract from the overall dessert though, if you want a really light filling, you can always just use the whipped cream and omit the ricotta. 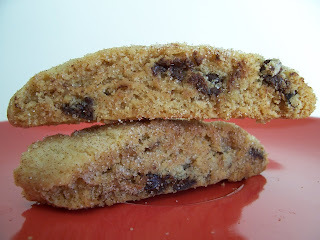 For those of you who love oatmeal cookies, here is another variation that is worth a try. 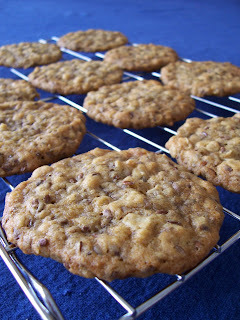 I've been making Farmland Flax Cookies for a while now and they are popular in my house. This batch was requested by my friend who had a surplus of flaxseeds sitting in her cupboard so I helped her use them up. The recipe is a snap to make and what you end up with is a golden, scoopable drop cookie batter. The flax seeds are added in whole, but for extra nutrition, try adding ground seeds as well. If you want, you can make them more 'seedy' by adding sesame seeds and sunflower seeds. You can make the cookies soft and chewy or a little more crispier depending on your cookie texture preference. Just don't bake them too long because they do brown quickly. I baked these cookies for 11 minutes and they were crispy around the edges and soft in the centre.